Remember: closing your pool correctly for the winter and freezing temperatures could be the most important thing you do as a pool owner for your pool's health and longevity. Think about it: during pool closing, if you cover your pool when there are live algae spores, it’s possible you could open it up next spring to find that full algae blooms have taken over. It will take you days or even weeks to get it swim-ready again! And if you just leave your pool completely uncovered, you’ll have to deal with cleaning out your pool (in frigid cold temperatures), re-balancing your pool water, and contending with freeze damage. So it's imperative that you get it right! In this guide, you'll learn how to do exactly that. Once you have all your tools in order, it’s time to get started. Here's our step-by-step guide for closing your above-ground swimming pool for winter. Detach and remove any pool accessories such as ladders, floaties, return fittings, solar blankets, pool alarms, pool cleaner, and diving boards. Clean all these items thoroughly by brushing them off and hosing them down. Then store them away out of the elements. Test your pool chemistry levels, including pH, alkalinity and calcium hardness. The pH level is the acidity of the water. A low pH level (under 7.0) can cause corrosion because it’s very acidic. But if it’s too high, it greatly reduces the effectiveness of the chlorine and causes scaling. Scaling creates deposits which can clog your filters and cause cloudy water. Total alkalinity is the measure of the alkaline substances in the water. Alkalinity and pH balance are closely related, but they are different measures. Both alkalinity and pH affect each other, however, so they have to be measured at the same time. You can raise alkalinity by adding sodium bicarbonate (baking soda), and lower the alkalinity by adding sodium bisulfate. This measures how hard or soft the water is. If the levels are high, they can cause calcium build-ups that make the water cloudy and cause sightly stains. If your pool’s calcium hardness is too high, put a little extra effort into scrubbing it and vacuuming in the next step. Also turn on the pump so that excess deposits can be filtered out. If it is still too high, a flocculant may be necessary. Clean your pool well by removing any visible debris with a net. Then use your pool brush to brush the surface and vacuum it well to remove any loose debris or algae spores that may have settled to the bottom. Shocking your pool is basically an industry term for super-chlorinating or oxidizing your pool for the purposes of killing off any bad stuff that your regular chlorine doesn’t kill. Regular pool shocking goes a long way toward keeping your swimming pool’s chemistry in balance and keeping algae growth under control. And shocking it before closing it for the winter will help keep you from many hours of work cleaning it up once you open it up in the spring. You can choose a chlorinated shock or a non-chlorine shock. Which type of pool shock you use depends on personal preference and the type of pool you have. Chlorine shock is harsher than non-chlorine, but also more effective at killing off algae. If you tend to have problems with algae, you will probably want to use a chlorine shock at least initially. Then if you want to, you can wait a week and use the non-chlorine shock before closing the pool. For vinyl pools, non-chlorine shock is usually preferred because it doesn’t leave a residue or damage your pool liner. Once you’ve chosen your type of chemical kit and shock, pre-dilute the shock in a five-gallon bucket of water. Then poor it around the edges of the pool. Follow the manufacturer’s instructions to determine the right amounts. It’s best to shock your pool at night when using chlorine shock to keep UV rays from destroying the active ingredients of the chlorine. If you’re using a chlorine shock, you will want to shock it at least a few days before you put the cover on. 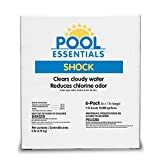 When using a non-chlorine shock, you can usually cover it in about 8 hours. Once you tuck your pool in with its cover, the water won’t be moving much. That’s why it is important to make sure its chemistry is balanced and there is absolutely no foreign matter in the water! Nothing is worse than opening up your pool in the spring to find algae or stains that could take you days to get rid of! So, how do you know what chemicals to use? 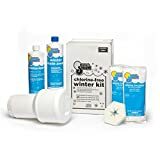 You certainly can buy each chemical you need separately, but there are plenty of good winter chemical kits on the market to make your job easier. Winterizing chemical kits can be purchased with chlorine or non-chlorine products. Lots of people prefer the non-chlorine type because they prevent the common bleaching and fading of the pool surface. Most kits contain a winterizer, shock, a stain-preventer, and a floater. In addition, you will need to buy a good algaecide. At this point, you should have already shocked your pool and it’s time to add the stain-preventer that comes in your kit. It's a chemical that keeps minerals and metals from depositing themselves on your pool surface. You can then add your algaecide according to manufacturer’s instructions to keep from having an algae problem once you open your pool next swim season. Ice expansion is one of the biggest risks to your pool when the cold weather hit, and that can include damage to your pool lines. Use a swimming pool antifreeze (note: not a regular antifreeze you use for your car) in the lines and just follow the manufacturer’s instructions. For the return line, seal it with a winter pool plug. Most above ground pool pumps and filters can be removed and cleaned for storage. You'll just need to disconnect all the hoses and unplug the wall outlets, and store the drain plugs in the pump basket. Then store the pump, filters and hoses out of the elements with the other pool accessories. Lower the water levels but never completely drain an above ground pool. Lowering the water level prevents excessive expansion of the water, which could crack the skimmer, but draining it completely puts unnecessary strain on your pool cover, liner and pool wall when snow and rain water collect on top. Remove any drain plugs from anything that stays in the pool. For example, sand filters are hard to move indoors because of the weight of the sand, so just remove the drain plugs and let it drain completely, which will prevent the filter tank from cracking due to any freezing water that builds up inside it. Air pillows keep the pressure off the sides of the pool in case of a freeze, keeping the ice from expanding the sides and causing damage. Be sure to inflate the pillows and cover the pool by placing them in the center of the pool. Some pillows can be tied to the sides to keep them in place, but even if they move around some, they'll still serve their purpose. Be sure not to over inflate the air pillow, as this could cause it to pop early in the season. Connect the air pillow directly to the winter cover with The Pool Pillow Pal. This will keep the pillow centered and secure. A winter cover is important for your pool because it will protect the water during the months when it’s not in use. Installing a pool cover can be cumbersome, so I always recommend getting help! Lay the cover out over the pool, making sure there is overlap on all sides. Get it as even as possible all the way around. Next, you will thread the cable through all the grommets in the cover. Follow the manufacturer’s instructions for attaching the cable to the winch and tighten is securely. 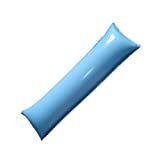 For areas where you experience extra wind or storms, it might also be necessary to use water bags or cover clips to hold the cover down. Note: it’s a good idea to invest in a good pool cover pump to help remove any excess water. If you follow these 10 simple steps, your above ground pool should stay clean and alga-free all winter. And believe me— you'll thank yourself for it in the spring!